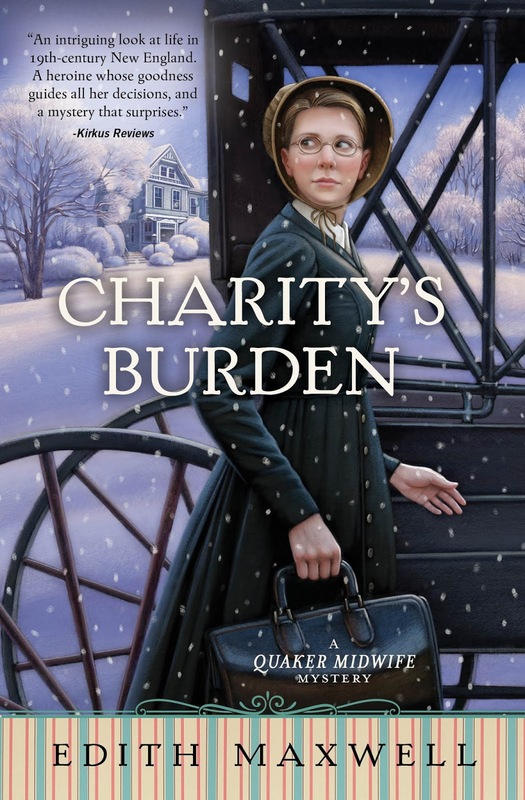 My name is Rose Carroll, from Edith Maxwell's Quaker Midwife Mysteries. 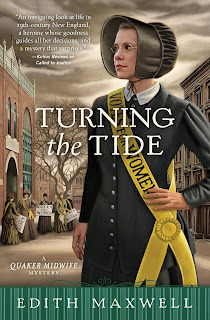 My author wishes to tell thee she will send one of thee a copy of Turning the Tide, which has recently been nominated for an Agatha Award for Best Historical Mystery. I know thee has not heard from me in quite some time. I have been terribly occupied with this year's presidential election. My dear friend Bertie Winslow persuaded me to become involved with the Woman Suffrage Association of Amesbury and their protest on Election Day. I was delighted that my mother traveled from Lawrence to join the fight, and astonished that Elizabeth Cady Stanton herself came to support us. But when the group's leader was murdered, it was as far from from a delight as I could imagine, especially since it was I who encountered her body. Finding who did the dastardly deed was not easy, and I myself was the subject of an attack. I blessedly survived, although it was not without consequence. But police detective Kevin Donovan and I did prevail and live to tell the tale. Friend Edith wishes me to ask thee what your most memorable Election Day was, whether it was the first time thee registered thy vote or another particularly remarkable experience at the polls. I might add that thee is extraordinarily blessed to have this privilege, one not available to me. She will happily send one of thee a copy of the book, the third in the series, so please include thy email address (whatever that might signify). She also wants me to tell thee that Charity's Burden, book #4, will be out in April and can be pre-ordered. Many years ago, before I could vote, I was at the YM-YWHA. There was a polling station there. We heard that Pierre Trudeau was there to vote. We went and waited outside the room. When he came out, we got to say "hello" and shake his hand. He won that day and became our Prime Minister. What an awesome story, Elaine! The memory I have is the day I went to the voting office and officially became a legal voter for the first time. For some reason, being sworn in brought tears to my eyes. My dad worked as an election judge one year and we went with my mom when she voted to visit him. Voting seemed so exciting with a huge metal machine with curtains and levers galore! Imagine my slight disappointment when I finally voted with what was essentially a scantron sheet like school tests! Thanks for the chance to win! My daughter turned 18 just in time to register to vote for Barack Obama. She was absolutely thrilled. I remember the year that it was so unusually warm on election day that we voted and then went golfing. First election I remember was as a very small child. Possibly 4 or 5. I went with my grandmother, who was raising more at the time. I tener stepping behind the dark curtain, and looking at this huge machine with knobs. It was so impressive, the memory has stayed with me all this time. meg85242 at gmail dot com. Meg, you are our lucky winner! Congratulations. Please send your snail mail address to me at edith@edithmaxwell.com. Thanks! I remember standing in line many times after work to vote. Now there is early voting, but I prefer to go to the polls on voting day. It's interesting to see how voting has changed over the years. My very first time to vote was when I was a kid. They brought in a couple of voting machines to school so we could all vote like our parents. I remember being very excited. I still remember how proud I was the first time I was old enough to vote in a presidential election. It felt great! I was so excited that first time I could vote. It was the very first time 18 year olds could vote and I had just turned 18. It was a presidental election too. The candidate I voted for didn't win but I proud to contribute to the democracy. Thanks for the chance. The first time I voted, I voted early before going to college. I was the first voter at my hometown precinct! One year, I had to take my oldest son with me. He was young at the time - well, too young to be left alone at home anyway. We talked about elections and the importance of voting on the way there. He even had to come into the booth with me (like I was going to leave him standing outside - NOT). All in all it seemed a very practical 'history' lesson that day! The very first time I voted I felt the enormity of it. Meg85242 is our lucky winner! Congratulations, Meg. Please send your snail mail address to me at edith@edithmaxwell.com. I wish I had a book for everyone.